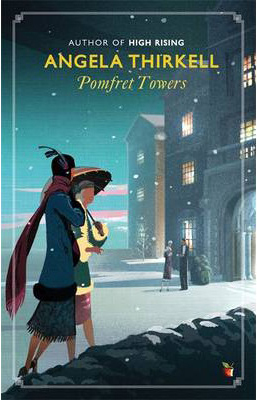 You may remember how excited I was when I first discovered that Virago was republishing Pomfret Towers by Angela Thirkell but, if it is possible, I think I may be even more excited now that I’ve seen the cover. It looks absolutely beautiful and, like the VMC editions of Thirkell’s High Rising and Wild Strawberries, the image is perfectly chosen for the book’s content. Okay these covers are absolutely adorable. Don’t they look gorgeous? I’ve had doubts about some of the modern Virago covers (Barbara Pym in particular) but these are lovely! Me too! Just pre-ordered for Kindle! Thanks for stopping by my blog! Those book covers look great! I already have all the Thirkell books, but I might just have to buy these just for the covers! I’m glad to know that the new covers match the contents. I was just asking the other day about the Pym covers and learned that they are not true to the books. I need to “crack the cover” of Wild Strawberries soon! What wonderful covers! 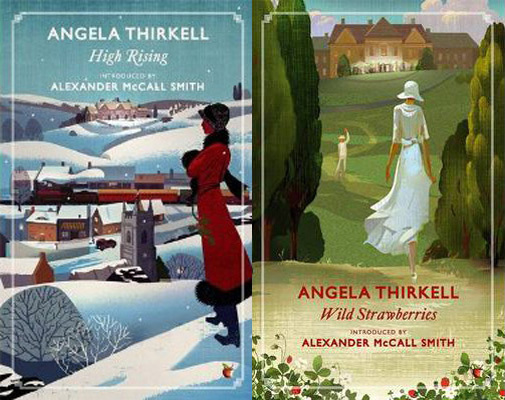 I haven’t read Angela Thirkell (yet) but those covers are very much making me want to. Wow, I adore these covers. I *still* haven’t read Angela Thirkell, but these editions make me want to dig into something of hers straight away. I bought and attempted to read High Rising, but could not get on with it at all, and passed the book on (with others) to a local charity. I love the covers, but I don’t think Thirkell is for me. Yes it is a lovely cover, but Pomfret Towers was supposed to be modelled on St Pancras Station, with its Gothic towers and arches and the ramp up to the entrance, thought to be too, too utterly hideous at the time the book was written, though of course nowadays beautifully restored and greatly admired. Nor do either of the ladies resemble my idea of Alice, Mrs Rivers, the Archdeacon’s daughter from Plumstead, or any of the other characters, except possibly Phoebe. Surely they would have been in tweeds for the country? And why is it snowing? And what’s that drystone wall doing? They’re not out in the fields. And come to that, why are they walking in town clothes up to the front door instead of being brought by car? Sorry to be pedantic, but Mrs Thirkell was absolutely specific about The Towers. All Thirkellites know that Pomfret Towers is described as resembling St Pancras Station and while this cover is attractive the building is incorrect. Also, it was not snowing on the evening of the houseparty and the guests arrived by car not on foo. the last word should be foot of course. Please correct. Thx. I hesitate to chime in here, as who knows what trouble I may unleash. In fact, I am the illustrator responsible for the the new Thirkell editions. I really appreciate the many kind words about the art, but even more so, the critiques of the various artistic mistakes. I stumbled into your conversation while researching the next three titles assigned to me, and it has goosed me to do better next time to reflect the ‘facts’ of the story (versus the ‘spirit’). Without trying to make excuses, the process leading to a finished cover image can be messy and easily derailed; there are art directors, editors, designers, sales & marketing folks, publishers- not to mention the cranky estates – all of whom have the right to chime in and stir the stew. (Not least of all, the naive illustrator.) And not all of these folks have actually read the books, either. Go figure. Me, well, Im a newcomer to Thirkell’s oeuvre and am still trying to get the hang of that era pictorially…. Anyway, Im gratified to know there are ‘Thirkellites’ here at The Captive Reader to whom I can turn to get things right the next time! 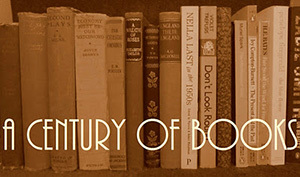 There are a dozen or so titles ahead of me, so I may be crowdsourcing here at some point. But, again, thank you. Whilst just flicking through a book catalogue, three tiny thumbnails of your cover art caught my eye, prompting me to track down the illustrator’s name so I could view more examples! Not an easy task as it turns out – you don’t seem to be credited on the copyright pages of this Angela Thirkell book series? Maybe they credited you on the back cover. Anyway, thanks to Google I tracked you down and can now admire lots more of your artwork. Ha! I have that effect sometimes. Thnx for the kind words, I really appreciate them. Working on The Headmistress , Marling Hall and one other at the moment…. Out this fall sometime. Cheers, m.